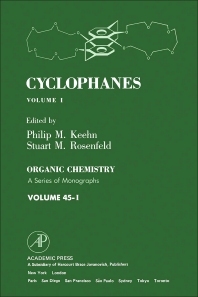 Cyclophanes, Volume I is a collection of papers that reviews cyclophane chemistry. One paper describes the genesis of the cyclophane concept, covering its past, present, and future possible applications. The results of experimental and theoretical studies show the interrelationships between the structure and energetics in the class of compounds known as cyclophanes. Another paper relates the X-ray crystal structure determinations of cyclophanes to set the crystallographic and structural data of these systems in such a form that will enable comparisons, lead to an understanding of the geometries and deviations, and open the application of data to other areas of cyclophane chemistry. One paper reviews the methods by which nuclear magnetic resonance is applied to assign stereochemistry in the fixed phanes to show the conformational effects that have been observed in the mobile phanes. Another paper explains the synthesis, chemical, and physical properties of [n]cyclophanes, including systems with benzene, naphthalene, anthracene rings, heteroaromatics pyridine, furan, pyrrole, and thiophene. This collection can greatly profit researchers and academicians in the fields of organic chemistry, physical chemistry, and other scientists whose works revolve around aromatic compounds and cyclophanes.